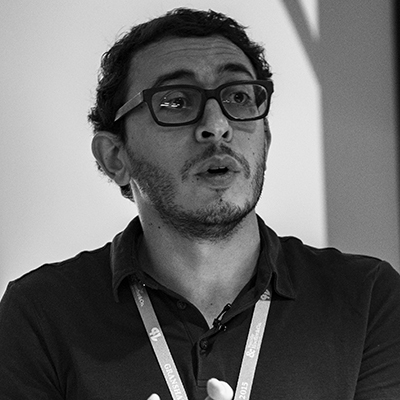 Haytham Nawar is an artist, designer, and researcher who currently lives and works in Cairo. He is Assistant Professor and Director of the Graphic Design program, Department of the Arts at the American University in Cairo. He is the founder and director of the Cairotronica, Cairo Electronic, and New Media Arts Symposium. Nawar received his Ph.D. from the Planetary Collegium, Center for Advanced Inquiry in Integrative Arts, School of Art and Media - University of Plymouth. He holds a Masters of Advanced Studies ZFH in Spatial Design, Institute of Design & Technology, Zurich University of the Arts, Switzerland and an MFA in New Media and BFA in Printmaking from the Faculty of Fine Arts, Cairo, Egypt. He is a Fulbright alumni. For over fifteen years Nawar has participated in several international exhibitions, biennials, and triennials, the latest of which was Venice Biennial in 2015. He has won numerous awards and acquisitions nationally and internationally.